A bison glances back while walking along the fence Tuesday afternoon at Spomer Ranch in Milliken. 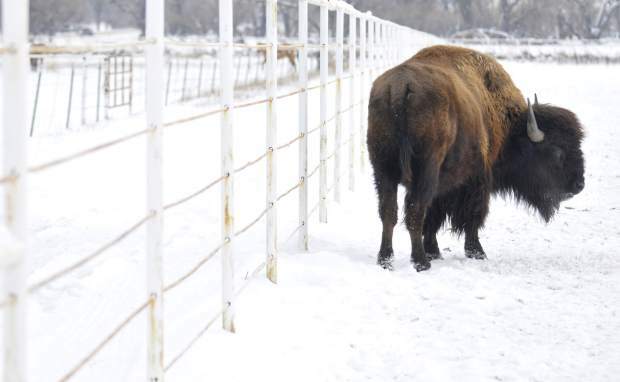 The Westminster-based National Bison Association petitioned to have the USDA begin its study. Looking back nearly 30 years to when he started Rocky Mountain Natural Meats — now the country’s leading bison meat processor and distributor — Colorado resident Bob Dineen said he knew there was demand in the state for bison meat and he wanted to help set an industry standard for quality. Now, as the U.S. Department of Agriculture has pledged to do a first-ever extensive survey on bison beginning this year, Dineen said he’s glad to see the USDA recognize the relatively small but growing industry. As is Dave Carter, the executive director of the Westminster, Colo.-based National Bison Association, who said demand for bison meat has increased a great deal over the last decade, especially among those looking for natural, lean options. He said the industry went to the USDA for help conducting a survey that will help producers battle health issues in the animals, and the agency agreed. “This is really a comprehensive study to address a whole manner of health and production issues in our business,” he said. The bison industry pales in comparison to those of traditional meats. To put it in perspective, Carter said about 60,000 bison were processed last year in the U.S. — compared to the 125,000 cattle slaughtered every day on average. Dineen, a Weld County, Colo., resident, and Carter said they’re happy with that, hoping to keep theirs more of a niche industry focused on natural production. “The worst thing we could have is everybody in the country going to the store tomorrow looking for bison because we can’t supply that,” Carter said. Up until about 10 years ago, bison was mostly viewed as a foreign meat. “Our biggest challenge over the last decade has been to get that first taste in people’s mouths,” Carter said. As more and more people showed interest in the meat, which is generally low in fat, the industry began working with the likes of Whole Foods, Costco and King Soopers to stock grocery store meat sections. Prices rose to $10 per pound of ground bison at one point last year, and they’ve settled at closer to $9, which Carter said seems to be working for consumers and producers. “When you start to see national customer demand increase like it has, we continue to scramble to keep up,” Carter said. Keeping up is difficult in an industry with a longer production cycle. Females generally take five years from birth to the age at which they can reproduce, Dineen said. “The problem is that you can’t just turn on and turn off supply in this industry,” he said. Since there is little wiggle room in terms of production, Carter said the results of the USDA’s new study will likely help ranchers do more with the resources they have available. For example, he said the study should give the industry more information on diseases, like microplasma bovis, for which vaccines and treatments aren’t as effective in bison. Carter said it’s important, especially to ranchers, to bring about an increase in production without sacrificing the natural way in which bison are raised. David Hayes, who owns and operates the Spomer Ranch near Milliken, has been raising bison and selling bison products since 1976. Hayes said he’s been happy to see prices rise, but higher prices have meant a diminished market for him, especially in higher-end cuts like prime rib. Hayes, who sells his products from his on-ranch store, said he’s getting more involved with buying from and selling to Dineen’s company, which supplies Ted’s Montana Grill and other national chains. He said he’s optimistic about the industry in general but he knows that attracting new ranchers to raise bison is no easy task. Dineen said much of the rise in bison prices has gone directly to the rancher, so he’s hopeful that will serve as an incentive for more people to get into the bison industry. Dineen said Colorado has been and will likely remain at the center of the bison industry. As for the industry as a whole, he said it’s important to increase production, but at a reasonable pace, so prices remain steady. Perhaps the USDA’s new study — and the information gained — will help them achieve that goal over time.